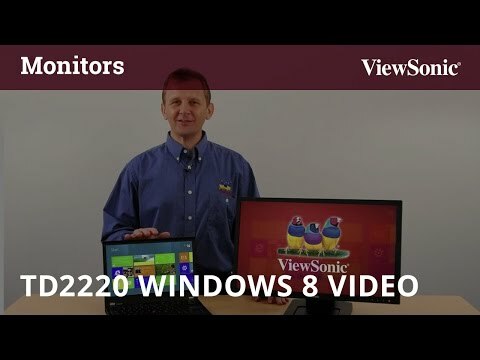 ViewSonic’s 22” display, the TD2220, is Windows® 8 compatible and boasts instant multi-touch functions via a USB connection. The advanced optical multi-touch technology allows for an intuitive operating experience regarding zooming in and out, level traversing and other touch operations which enhance work efficiency. With finger touch, stylus, and support for use of other tools for screen inputs, the TD2220 allows responsive and fluent panel navigation as well as flexible user demands. The Full HD 1080p resolution displays true color and delivers high quality multimedia entertainment content. With a set of 2W speakers, users will experience the all-immersive audiovisual entertainment. Two built-in USB ports allow easy access to storage devices or multimedia devices connections for expansion demands. The TD2220 uses a topaz class 7H hardness protective glass, providing a robust and safe usage scenario to avoid damage or scratches. With all these benefits, The TD2220 is a perfect choice for public navigation systems, POS, and multimedia educational applications for the most convenient and efficient touch functions. The all-new TD2220 uses the latest optical touch technology, featuring high light transmission advantages to perfectly present true image colors for both video and images. Two-point touch support not only replaces mouse, but it allows sliding, rotating, zooming other intuitive operation. The high stability and responsiveness of this touch panel further enhances operation for better work efficiency. Whether using a finger, object, or gloved hand, The TD2220 can be operated with fluency and meet diverse demands. The optical touch display TD2220 uses an 7H hardness topaz-class protective glass as a panel surface to offer strong anti-wear and high durability as well as withstand impacts from other objects or scratches of finger nails and pencils. Perfect for public spaces or educational institution, the TD2220 high harness provides the safest and most durable touch display effects. TD2220 supports Windows® 8 touch function and boasts USB HID (Human Interface Device) for plug-and-play. TD2220 can be connected through USB for instant two-point touch operation, experiencing easy navigation through intuitive touch operation. Built-in two USB ports provide easy connectivity with any highspeed transmission storage device or peripheral multimedia devices to greatly enhance expansion flexibility and higher convenience. Built-in a set of 2W speakers offer users true-to-life audio effects for multimedia content, whether it be educational software applications, corporate imaging or advertisement promotions, users can avoid the inconvenience of connecting extra speakers and realized a wider space on desk as well as better audiovisual enjoyment. ViewSonic's proprietary Eco Mode function is built into all LED displays, offering options to "Optimize (75%)" and "Conserve (50%)". Both modes reduce display brightness and conserve up to 25% energy. Especially in a low ambient light, Eco Mode adjusts brightness and improves visibility while reducing eye fatigue and prolonging the display lamp lifetime. With Eco Mode, lamp replacement expenditures are reduced while practicing ecofriendliness.